US - Indonesia (USINDO) kembali mengadakan acara diskusi. Jl. Jendral Sudirman Kav 58. Since the launch of the U.S.-Indonesia Comprehensive Partnership in 2010, discourse on the relation between the two countries has been focused mainly on government-to-government partnership. This attention overshadows other forms of cooperation that may help promoting partnership goals. One of these other forms of partnership is city-to-city partnership. City-to-city, also often called sister cities, partnership is a form of cooperative agreement made between towns or cities in geographically and politically distinct areas to promote cultural and commercial ties, and foster people-to-people connections. The US sister city program formally began in 1956 and among sister cities between Indonesia-U.S. is the Bogor - St. Louis sister city agreement. Between the two cities, multiple links have been established in both high- and low-level connections. Former United States Senator Christopher "Kit" Bond and World Trade Center St. Louis led a trade mission of ten companies and four universities to Indonesia in 2012, working in this partnership to establish connections both within the city of Bogor and on the bigger national scale. The partnership engages people in both cities on multiple sectors, including industry, business, tourism, and politics, however it has mainly focused on education and economic links. The sister-city program has provided a vehicle for these public-private partnerships. The partnership offers few questions namely: What are the main benefits gained from city-to-city partnership? How do global city-to-city partnerships help growing cities manage local challenges and impact citizen welfare, business, and educational outlook? How can the private sector & academia work together on innovation and research in terms of economic and educational connections? 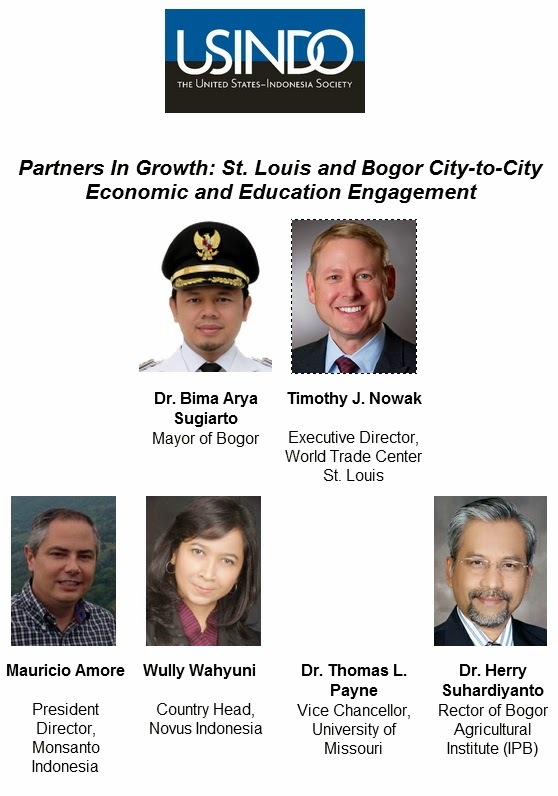 By putting a spotlight on the St. Louis-Bogor City-to-City Partnership, this Open Forum hopes to answer those questions. USINDO is delighted to host this special Open Forum, welcoming Dr. Bima Arya Sugiarto, Mayor of Bogor, Timothy J. Nowak, 2014 Eisenhower Fellow and Executive Director of World Trade Center St. Louis, Mauricio Amore, President Director of Monsanto Indonesia, Wully Wahyuni, Country Head of Novus Indonesia, Dr. Thomas L. Payne, Vice Chancellor of University of Missouri, and Dr. Herry Suhardiyanto, Rector of Bogor Agricultural Institute (Institut Pertanian Bogor, IPB), as members of the panel of speakers. Join us for this highly informative event. Dr. Bima Arya Sugiarto is the newly-elected Mayor of Bogor for the 2014-2019 period and Head of Dewan Pimpinan Pusat (DPP) Partai Amanat Nasional (PAN) for 2010-2015. He has been deeply involved in many organizations focusing on Bogor's development, including Paguyuban Bogor. He obtained his Bachelors in University of Parahyangan, his Master of Art in Development Studies in Monash University, Australia, and his Doctorate in Australia National University (ANU) . Timothy J. Nowak is a 2014 Eisenhower Fellow and the Executive Director of World Trade Center (WTC) St. Louis. Since its 1993 inception, as the leading internationally focused organization in St. Louis, WTC cultivates important relationships and a partner approach to its work of guiding businesses to expand into foreign markets. Mr. Nowak holds Bachelor of Science degrees in Marketing and Logistics from the University of Missouri - Columbia and a Master of Business Administration from Webster University. Mauricio Amore is the CEO of Monsanto Company in Indonesia.An agriculture sector veteran for close to two decades, Mauricio has worked with farmers in Colombia, Mexico, Latin America North, and now he leads the Indonesian team in developing strategies to achieve the Company's vision for Sustainable Agriculture. Monsanto Indonesia is part of Monsanto Company, a leading global provider of technology-based solutions and agricultural products that improve farm productivity and food quality. Amore holds a B.S. in Industrial Engineering from Universidad De Los Andes, Colombia, and a Masters in Business Administration from Yale. responsibilities to manage the business in Singapore and Brunei. She has been involved in the animal agriculture industry in Indonesia and across the region for more than 14 years. Novus is a global leader in animal health and nutrition products and programs for global animal-agriculture industry. Wully holds a B.S. in Animal Nutrition and Feed Science from Bogor Agriculture Institute and a Masters in Business Administration from ITB School of Business and Management. Dr. Thomas L. Payne has served as vice chancellor for agriculture and dean of the College of Agriculture, Food and Natural Resources since Jan. 1, 1999. Dean Payne was professor and head of entomology at Virginia Polytechnic Institute and State University (1987-1993) before becoming the Ohio State University College of Food, Agriculture and Environmental Sciences associate vice president for agricultural administration, associate dean for research, and director of the Ohio Agricultural Research and Development Center (1993-1998). Dr. Payne is a recipient of numerous awards and recognition, and he is the author and co-author of more than 130 publications and is founding co-editor of the Journal of Insect Behavior. He received his bachelor's degree in zoology from the University of California, Santa Barbara, and his master's and doctoral degrees in entomology and physiological psychology from the University of California, Riverside, in 1969. Dr. Herry Suhardiyanto is the rector of Bogor Agriculture Institue (Institut Pertanian Bogor, IPB). He started his career as a lecturer in the Department of Agriculture (formerly called Department of Agricultural Mechanization), Faculty of Agricultural Technology, Bogor Agricultural University in 1981. During his first tenure as rector, he led IPB in becoming the most innovative university in Indonesia, as approved by the Ministry of Research and Technology. He obtained his bachelor's degree in Agricultural Mechanization Department, Faculty of Agricultural Technology, Bogor Agricultural University in 1981, his Master degree in Kochi University of Japan in 1991. And his PhD in agricultural engineering from Ehime University, Japan in 1994.